The new F6T white ink has been optimized for dark garment printing, including synthetic and cotton materials, while maintaining unparalleled rigid substrate print capability. Rocky Hill, CT USA – Building on their patent pending DTG application with UV LED ink, DCS further refines this ground breaking combination of UV print technology, ink formulation, and process steps with the F6T white ink. Used in conjunction with standard F6 CMYK+Cl inks and compatible F6T Edition Direct Jet UV LED printers, operators are relieved of the task of using harsh chemical pretreatments for dark garments, both synthetic and cotton. The process steps are timesaving, simple, and easy to follow. Just like the IRF4 and IRF6 inks that came before it, the F6T white ink is complete with CPSIA test results. 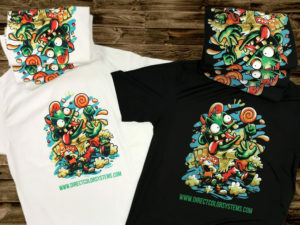 For the purpose of this testing, DCS provided cured swatches of IRF6T white ink and cured IRF6T white ink printed to a black Gildan, OEKO Tex certified shirt. Please visit directcolorsystems.com for complete CPSIA test results or to request a sample. All F6T Edition Printer Models in the MVP Classic, 1800z, and 7200z product lines. Known for pushing the industry forward, Direct Color Systems has brought to market advanced UV LED printing features and applications like this patented ADA/Braille signage printing process, cylindrical and conical printing with the EasyCyl, a complete bulk white ink circulation system, patent pending DTG capabilities with UV ink, TEXTUR3D™, conductive ink/additive manufacturing printing, and many more.